Two days before Earth Day 2018, the Brooklyn Waterfront Research Center (BWRC) will present a full-day conference on what climate change has done, is doing, and will do to the Brooklyn waterfront. The conference will also explore what residents, small businesses, local officials, neighborhood groups, city, state, and federal agencies, corporate and individual property owners, and operators of large industrial sites have done, are doing, and will do in response to climate change. While we can chart what has been done and note what is being done, what will be done/what should be done are not yet settled nor agreed upon and will form the core of the conference’s discussions. Those discussions will center on two issues: the first will be the triple threat of sea level rise, subsidence (land sinking), and storm surges, and the second will be the equity and environmental justice questions these threats raise. While the Brooklyn waterfront has much in common with other coastal regions—and with those of its sister boroughs—some of the challenges it faces are unique. We all recognize the dramatic transformation of much of the Brooklyn waterfront that has occurred in little more than two decades. The question is: Will we be faced with another dramatic transformation of the waterfront in the coming two decades, but this time one that is Nature-driven? The conference will begin with a provocative primer on sea level rise, subsidence, and storm surges, detailing how each presents Brooklyn with a set of unique but interrelated problems. We are planning a panel that will examine how the problems have already presented themselves—in the waterfront’s infrastructure, its transportation systems, its low-lying communities, its beaches, and its public housing. 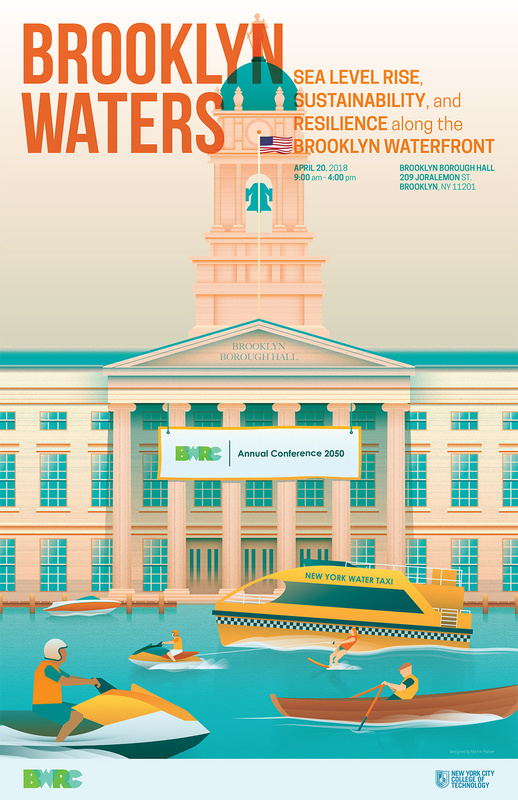 The bulk of the conference, however, will focus on the efforts and plans to make the Brooklyn waterfront resilient. In short, what is the future of Brooklyn? We will hear from various waterfront communities about their planning and design efforts. City officials will speak about resiliency planning and the financing involved in implementation. Architects will speak about using WEDG standards and designing for resilience. Panelists will also discuss efforts to protect Brooklyn’s natural and constructed shorelines, including Jamaica Bay, Coney Island, and Brooklyn Bridge Park. Throughout the course of the conference, we will touch on pressing urban policy issues related to zoning, engineering, insurance, small businesses, and land use. The conference will close with select panelists addressing controversial issues such as the wisdom of managed coastal retreat, the efficacy of sea-walls and barriers, and the appropriate time-frame during which crucial community planning decisions must be made.